Samsung’s Chromebook Plus launched last year for the price of $449. This month, Samsung will launch Chromebook Plus V2, an apparent second iteration of the Chrome OS-powered laptop. 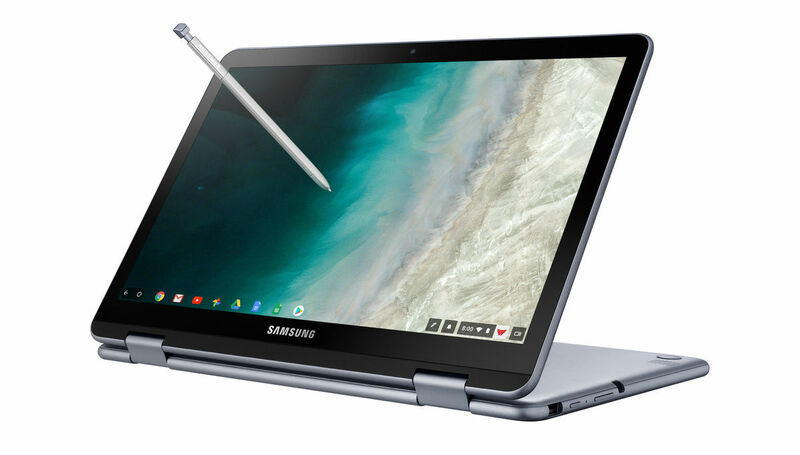 Last year’s Chromebook Plus featured a 12.3″ LED Display (2400 x 1600), 4GB RAM, OP1 ARM processor, 32GB Storage, and built-in S Pen. This year’s model doesn’t differ too greatly in terms of internal specs, but somewhat oddly, Samsung has opted for a 12.2″ FHD display this year with a max resolution of 1920 × 1080 (aspect ratio of 16:10). For processing, Samsung went with an Intel Celeron 3965Y. Samsung has also added an additional camera, so now you’ll have a standard webcam on top of the display, as well as one on the keyboard deck for you to hold up your massive device and snap shots with. Beyond specs, the hardware is capable of the same transformation from laptop into tablet, but maybe more importantly, you’ll still get the S Pen experience you had last year. On the side of the laptop is a little slot where you can eject and insert the S Pen for your note taking and drawing needs. Chromebook Plus V2 will be available starting this month at Best Buy for $499.